Fantastic and Free First Fridays: Florida (Aggre)GATORS!!! As summer winds down, teachers around the country are gearing up to return to the classroom and start fresh with a new school year. I remember well the excitement of preparing myself for the new year—new students, new ideas to hopefully improve upon what I had done with the previous year's class, and sometimes even new curriculum for which I was eager to start using with my students. While "summer break" does not apply for many in the world of adult education, this coming year definitely promises plenty of new things. Over the course of the next 11 months, states around the country will be switching over to new tests used to determine learner academic skill levels and to subsequently measure their academic gains over the course of the year. Given the previous test was in place for over 15 years, instructors will be busy this year working to align their curriculum—existing and new—to the new tests once their states mandate the switch be made. It was not long ago—January 2014—when the adult education field faced a similar shift. This was when the 2002 GED® Test was retired and the new, fifth series of the test was launched. In addition to this new version of the GED® Test, along came two completely new High School Equivalency (HSE) testing options—the Test Assessing Secondary Completion™ (TASC Test) and the High School Equivalency Test (HiSET Exam®). All three of these HSE tests promised to be far more rigorous than the previous test in order to better reflect the the skills needed for adult learners to truly be college and career ready in the 21st Century, and they certainly delivered. As a result of more rigorous tests, new curriculum was developed by publishers, and states have been continuously working to align and adjust their curriculum and instruction to steadily improve learner success on the HSE tests. However, despite the fact that these HSE tests now have been around for nearly five years, instructors still are looking for ways to provide more robust preparation for their students. This is true in particular in mathematics, the subject area that has the lowest pass rate of any of the subject areas on the HSE exams. Can you estimate how many oranges are in the crate? I honestly have no idea, and there is no prize for guessing correctly even if I did know. BUUUUUUT...I will give you a great free learning resource from the Sunshine State! Fortunately, where there is great need, often there are tirelessly dedicated folks working creatively to figure out ways to use free and open education resources to address those needs. In some strange cosmic alignment, it just so happens I'm in Florida this week training instructors in numeracy best practices. Why is this strange? Well, it also just so happens that Florida is home to some of those dedicated folks who are finding innovative ways to expand learning opportunities for their adult students using OER. So, what better place to be than the Sunshine State to write and post this month's Fantastic and Free First Fridays resource of the month, a free mathematics self-study tool developed by the Florida Literacy Coalition to support learners as they prepare for the GED® Test—the GED® Math Video Resources collection. 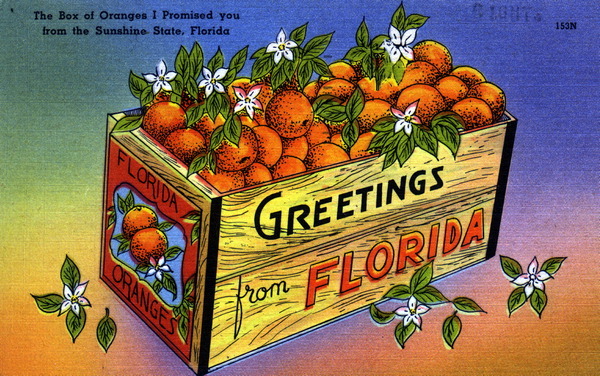 The Florida Literacy Coalition is no stranger to the world of free resources. In fact, the only reason I came to learn about the Math Video Resources Collection was because I had a call with them just last week to learn more about their amazing Health Literacy resources, which are featured in CrowdED Learning's Health Literacy Resource Directory. During the call, it was shared with me that they recently released the Math Video Resources collection. Check out this video that provides a great 3 minute overview of the tool. The library includes an extremely easy-to-navigate menu, which allows leaners to quickly locate the topic they would like to study. Once they open a topic, there is a selection of videos that have been aggregated from multiple sources—particularly Khan Academy—and align to that particular skill. Learners can navigate quickly to the topics they wish to study. Once in a section, each of the topic bars expands to show the videos that have been compiled related to that topic. For every topic, FLC has created a quiz that provides immediate feedback to help learners to check their understanding. At the end of a set of topics, there is a quiz that has been created by FLC using Google Forms. 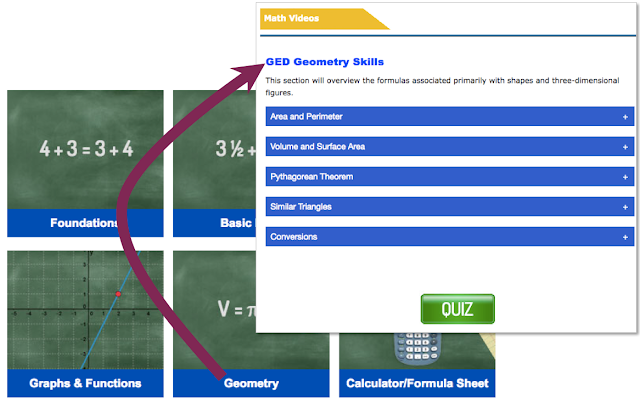 Learners can take the quiz at any time, either as a pretest to see their topic readiness or as a posttest to check their understanding after viewing the videos. The quizzes are set up so learners receive immediate feedback once they submit the completed quiz. As learners work through topics, there is a downloadable tracking sheet that can be printed or can be downloaded and typed in for learners to check off what videos they have watched. If working within an educational setting, instructors can use this as either a tracking sheet or as an assignment tool for indicating which particular videos they want leaners to watch. Why, you might ask, is something like this necessary when sites such as Khan Academy and others already have topical navigation of their own? There are multiple reasons, but I'll give two biggies. First, if you don't know what you don't know, and you don't know what you need to know in relation to a goal (be it a test, a skill needed for a job, etc. ), how do learners know where to begin in order to develop the specific skills they need to master? In CrowdED Learning's recent survey that was sent to educators asking how we can better organize resources, one of the comments we saw multiple times was while students tend to respond well to Khan Academy videos, they often get frustrated trying to find the videos they need for the specific skills they are trying to develop. By aligning resources from multiple sources to the specific skills needed in order to prepare for the GED® Test as has been done by FLC with the GED® Math Video Resources Collection, learners have a clearer understanding of what they need to work on and, more importantly, have greater assurance they aren't wasting their time working on skills they don't need to learn. As someone who spends a good amount of time each day trying to learn the ropes of the myriad things I need to know in order to launch a successful nonprofit organization, I know how daunting it can be to poke around the vast range of content out there to find quality information aligned to my needs; and, before that, to even know what it is I need to learn. The second big reason such aggregation and organization is necessary is that while Khan Academy is an amazing example of how the development of quality, free resources can not only be done successfully but can be scaled for widespread use, the format of the content presentation within KA's videos or within any learning software, platform, book, or worksheet does not necessarily work well for every single learner. When we aggregate content from multiple sources and carefully organize them within topics related to learner goals, we increase the likelihood that more learners can be successful by giving them the ability to find targeted learning content that best lends itself to their individual learning styles. Aggregation Nation—Come Join the CROWD! It's content aggregation efforts such as the GED® Math Video Resources Collection that we at CrowdED Learning are working to expand with our upcoming learning plan generator, SkillBlox. Through SkillBlox, we aim to support and scale the alignment efforts of the Florida Literacy Coalition and by like-minded educators and organizations around the country by establishing a growing library of curated resources that align specifically to the skills adult learners need, all the while exploring and developing presentation and delivery options that maximize the ease with which content can be accessed by learners and instructors. Simply put—we know the possibility of what we can accomplish is far greater if we begin working together on free resource alignment than if we work alone. Why yes....yes I did just use a "Greater-than Gator" to show this inequality. You're very welcome. Many thanks to the great folks at the Florida Literacy Coalition for your efforts to offer learning for all by way of the GED® Math Video Resources Collection. And, before I sign off...I'd be remiss if I did not apologize to those Floridians who may not appreciate my "Gator" play on words due to collegiate affiliation or otherwise. But, I mean...can you blame me for capitalizing on such perfect opportunities for punnery?!?! ?